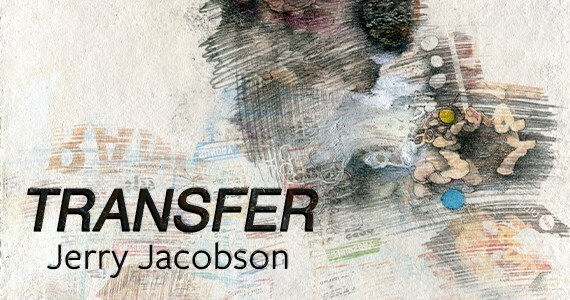 Modified Arts is proud to exhibit “Transfer” a selection of ink and rust drawings and never exhibited transfer drawings of longtime alumnus Jerry Jacobson. In TRANSFER, Jacobson presents selected works from two ongoing series that he has been developing over the last several years. The ink and rust drawings are a hybrid of printmaking, painting, and drawing. Jacobson collects metal objects that he finds on his routine neighborhood walks. He composes images in a similar way to photo-grams by letting oxidized metal objects and ink set in on a surface over a period of time. Jacobson developed the process as a way to ‘let go’ and let chance take care of some of the work. It is not an immediate process like painting and has a bit of the ‘ah-ha’ moment that happens when pulling a print. The transfer drawings stem from the many postcard drawings that Jacobson used to make to mail to friends. By transferring parts of found ads onto various surfaces Jacobson creates abstract compositions that combine familiar symbols and typesets with hand drawn elements that seem to reference the organic. Jacobson has been making these works for a long time but had opted to not show them until now.